Much of the collaboration needed today is neither easy nor automatic. It once was both, because we are endowed with a collaboration response, that is triggered by certain conditions. Our collaboration response is similar to our fight/flight response (triggered by an aggressive act) or our relaxation response (triggered by focusing on our breath). In many sectors of society we have given up, satisfying ourselves with either compromise or what appears to be the best “deal” available. The hard part of collaboration is the point at which individuals (and groups) must let go of self-interest if an optimal solution is to be achieved. Common wisdom to the contrary, we humans readily do this when the conditions are right. Soldiers fall on hand grenades when their platoon is threatened. Seemingly intransigent leaders will sacrifice for a larger social entity when they know (emotionally as well as intellectually) that it’s the right thing to do. They will do it easily and automatically when the circumstances are ripe. 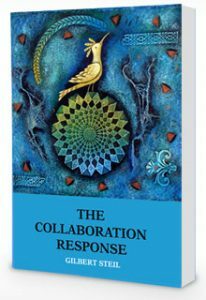 In this new book, author Gilbert Steil discloses the secrets of creating the conditions under which our collaboration response can still be elicited, still be unleashed. It took thirty years of study and practice for him and his colleagues to understand this phenomenon—and then explain it to others in plain language. From Silicon Valley to villages in rural Asia, Gil and his colleagues have employed our natural collaboration response in helping organizations and communities find optimal solutions to strategic (and sometime tactical) issues. The book has five parts. Part I lays out the eight conditions that together trigger the collaboration response, which the author calls “axioms.” The impact of each axiom on collaboration is explained with a true story. Along the way the reader is exposed to everything he or she needs to know about social psychology. Part II shows with two examples how the axioms in Part I have been understood by others and put to use in the world. Part II features snapshots of the work of Elinor Ostrom (who won the Nobel Prize for economics) and the work of John Downs (who helped the world back down from nuclear confrontation in the 1980’s). 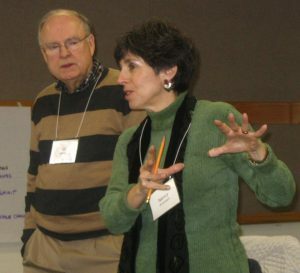 Part III provides the reader with a practical set of tools for planning and leading meetings of “whole systems”—an organization and all its external stakeholders or a community and all its internal and external stakeholders. Detailed examples from the work of Gil Steil Associates illustrate the tools. Part IV is a tea break. Over virtual tea, the author answers questions from students and readers. Part V examines three popular methods of strategic planning through the lens of the eight axioms of the collaboration response. A sample chapter awaits you here!